2013 was a pretty good year for anime and anime music, with a wide variety of styles to choose from. Whether you’re a fan of orchestral, bombastic flair, or are looking for a lighter side of life, there were many soundtracks and anime theme songs that were up to bat. As is our usual tradition, we’ve provided a writeup of what we thought was the best anime music of 2013. Some of you may find the results of this list to be surprising, especially since 2013 was the year in which Attack on Titan let loose its fury upon the anime fandom. But alas, it did not win best anime soundtrack; that prize went to the lesser-known, but far better Tanken Driland, an anime based on a mobile game, but received a big boost by being scored by Yoshihisa Hirano. Yoshihisa Hirano also managed to pick up the best anime composer award, not only for his work on Tanken Driland, but also his work on the Hunter x Hunter movies, Phantom Rouge and The Last Mission. Hirano’s consistency is a shining point and his versatility is a big bonus, since he composes rock, electronica, and throws in a bit of jazz in addition to his usual classical style to top things off. When you look at the theme songs, many of the winners weren’t from the big shows that caught people’s attention. The award for best opening theme went to Red Data Girl‘s “Small Worldrop”. This single by Annabel shines in its simplicity and her delivery gives it much heart and nuance to settle us in nicely. Probably to the relief of many anime fans however, Attack on Titan‘s “Guren no Yumiya” did manage to snag the runner-up position. On the ending theme side, our staff’s love for KOKIA’s music once again reared its head and we found ourselves falling for Space Battleship Yamato 2199‘s “Kioku no Hikari”. KOKIA’s voice is flawless in its delivery and we loved the way it flows and recedes in perfect harmony. And again, simplicity won out for the runner-up position, which went to The Wind Rises‘s “Vapor Trail”. Sung in 1973 by Yumi Matsutoya, we felt that it captured The Wind Rises‘s sentiments beautifully and was a perfect way to close out Miyazaki’s career. So, go read our full impressions and let us know what you think of our selections. Any other anime soundtracks or theme songs you think are more deserving? Comment away! 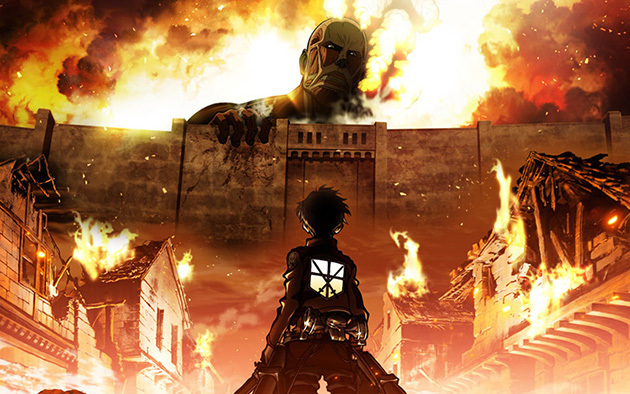 Given how popular Attack on Titan’s music has become, it’s not a surprise that there have been a host of Youtube artists who’ve been looking to put their own interpretations or transcriptions of the anime’s music. Today’s delivery is by Tim Morrison, who gives us his take of “Vogel im Kafig” from the first soundtrack, so give it a listen and let us know what you think about it.